The Mount Shasta area has some of the finest waterfalls in California. From the untamed plunges high on the flanks of Mount Shasta itself to spring-fed wonders like Burney Falls, the North State is blessed with an abundance of fantastic falls. 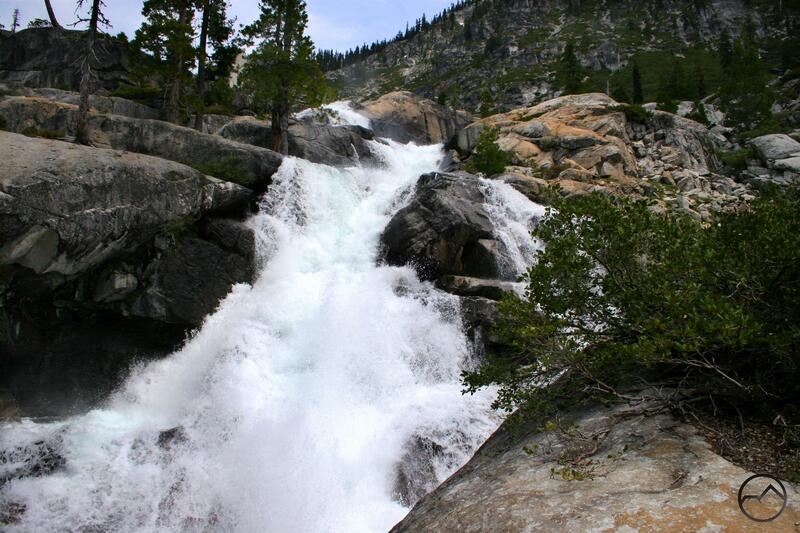 Some of these rank among the finest waterfalls in California and the U.S. Most of the well-known waterfalls in this region are in the Cascade Range’s demesnes. However, what generally escapes notice is a collection of tremendous waterfalls to the west of Mount Shasta, in the heart of the Klamath Mountains. These are found in the rugged canyons of the Trinity Alps. Boasting a seemingly limitless array of craggy towers, deep canyons and gorgeous alpine lakes, the vast Trinity Alps are the wildest corner of the North State. Though the Trinities, a sub-range of the Klamath Mountains, are composed of numerous different types of rock, it is the presence of extensive stretches of stark, white granite (and the craggy peaks composed thereof) that produced the mountains’ alluring name. 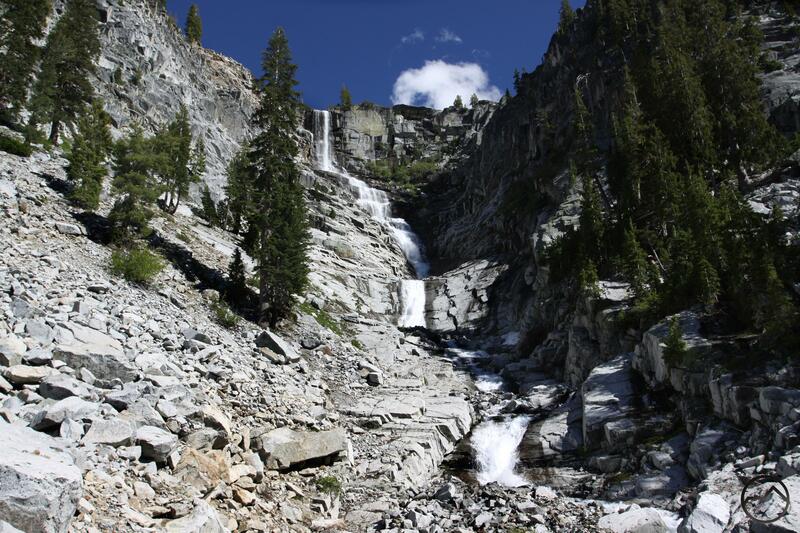 Like the Trinity Alps’ geologic cousin, the Sierra Nevada, the erosion resistant granite is the perfect canvas for nature’s display of sublime waterfalls. The Trinity Alps do not disappoint in this regard (truthfully, they don’t disappoint in most regards). Although there are a number of great waterfalls scattered throughout the range, there are two areas in particular that boast waterfalls that not only rank high on lists of Northern California waterfalls but are among the finest falls anywhere in the country. The first of the two areas is Canyon Creek, which is home to a trio of awesome cataracts. While not heavily traveled by Sierra Nevada standards, Canyon Creek remains the busiest corner of the Trinity Alps. None of these falls are especially tall but their volume of water is staggering. In shape and scope, they are somewhat similar to the excellent cataracts found along the Tuolumne River in Yosemite. 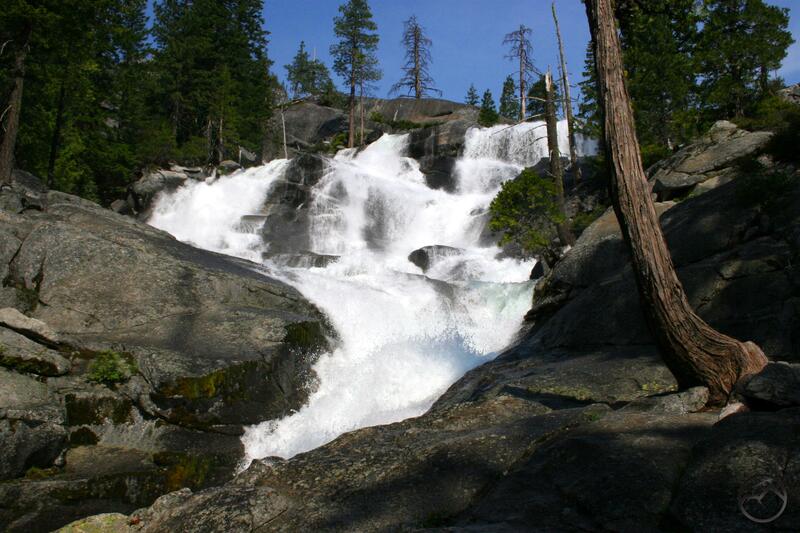 The Trinity Alps’ other major waterfall is epic Grizzly Falls. One of the highest waterfalls in the North State, Grizzly Falls is also one of the most magnificent waterfalls to be found anywhere. Unlike many of the falls in the Cascades, these are wilderness waterfalls (of course, the waterfalls on Mount Shasta are a significant exception to this, being found in remote, nearly inaccessible corners of the volcano). 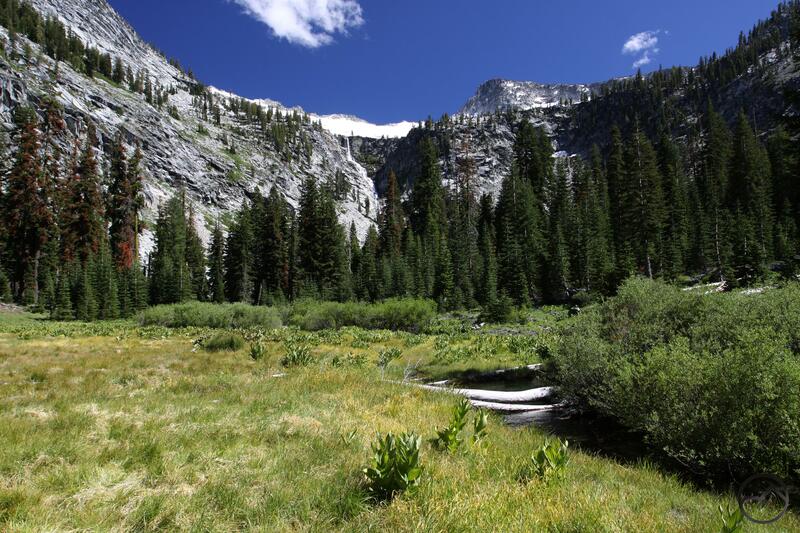 They are found in the heart of the Trinity Alps’ expansive backcountry. Consequently, they are generally only accessible to backpackers. For those who do make the journey into the deep recesses of the Trinity Alps, these excellent waterfalls are a terrific reward. While it is generally recognized that there are three waterfalls in Canyon Creek’s spectacular canyon, an Upper, Middle and Lower Canyon Creek Falls, it is the lowest of these that is preeminent. Though it may sometimes be referred to as ‘Lower’, make no mistake, this is THE Canyon Creek Falls. The giant cataract is about 120 feet high but, while not exceptionally tall, it has a massive volume of water. It is split into two sections, the higher half funneling through a narrow trough and then rocketing out over the cliff while the second, lower, half is a wide, tall cascade down a cliff. The combination of the two varied stages of the waterfall gives Canyon Creek Falls a great deal of drama. The incredible volume of water drenches the waterfall with a sense of frightening power. It is certainly one of the most fearsomely beautiful waterfalls in Northern California. Ironically, Canyon Creek’s preeminent waterfall is typically overlooked. At one time the Canyon Creek Trail passed alongside the waterfall. Once the path was rerouted higher up on the flanks of Canyon Creek the falls were lost from the trail’s view for the most part. There is only one brief point where the perceptive hiker can observe Canyon Creek Falls. Exacerbating the problem is the presence of a smaller but still sizable and dynamic waterfall a little upstream from the main waterfall. Easily viewed from the trail, this is now often mistakenly considered Lower Canyon Creek Falls. For those hunting for the true giant of Canyon Creek, a faint trail still exists leading off of the main path to a terrific vantage of the splendid waterfall. While not as tall as Canyon Creek Falls, the middle waterfall of Canyon Creek’s fantastic trio is a tremendous cataract in its own right. About 100 feet high, the waterfall is nearly as wide as it is tall. This is particularly true earlier in the season when the melting snow swells Canyon Creek. When it is at full force, Middle Falls pours over the wide cliff in three large columns, each thundering down the rock face. A broad bench recollects all of the water and then funnels through a narrow gap in the rock as the raging creek once again races over another cataract. Even later in the year, when the creek’s flow has diminished, the Middle Falls is still an impressive sight. The three initial columns are reduced to only one but the drop is still impressively high. The falls are not actually visible from the Canyon Creek Trail. However, a well-established use trail branches off of the main path and leads to the base of the waterfall where the view is excellent. 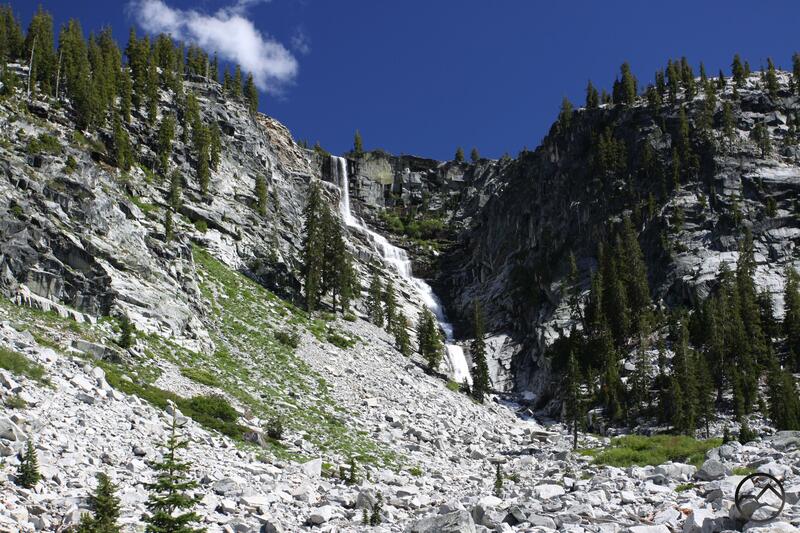 Scrambling up the rocky slope alongside the falls leads to large granite slabs alongside the creek with an amazing view of the Boulder Creek Lakes basin. Be sure to note the towering freefall where Boulder Creek leaps off the granite bench that holds the Boulder Creek Lakes. The waterfall is unnamed but is wonderful nonetheless. Unlike the other major waterfalls in Canyon Creek, there is some ambiguity as to which cataract is actually Upper Canyon Creek Falls. There are two awesome waterfalls within a short distance of each other on Canyon Creek. The downstream waterfall is the taller of the two but is more of a cascade rather than a completely vertical waterfall. Conversely, the upstream falls is not as high but is much more of a plunge. Nothing in particular seems to indicate one over the other. 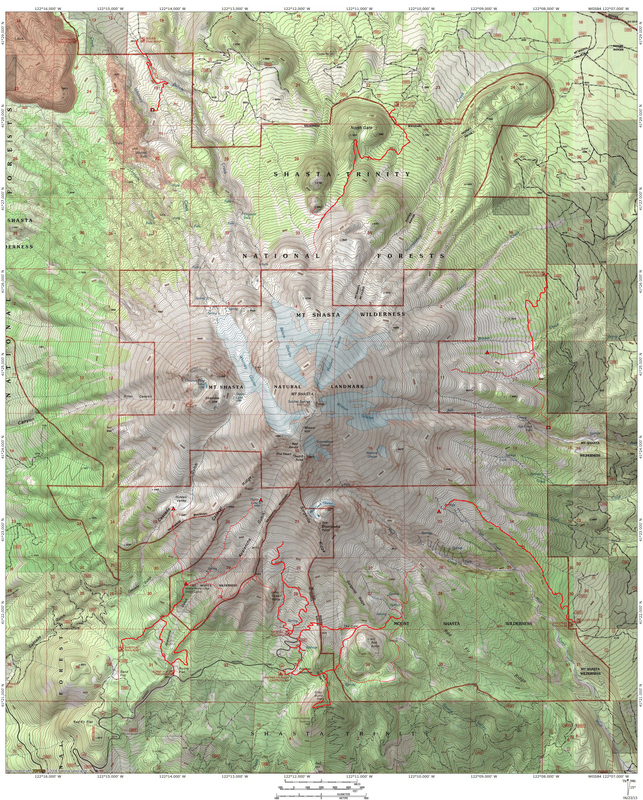 Both are indicated on the USGS topo map. If push were to come to shove, it seems likely that the upstream waterfall is actually Upper Canyon Creek Falls because it is much more of a plunge and still impressively high. This is also the only one of the two waterfalls that is visible from the Canyon Creek Trail. Incidentally, there is an astounding campsite located on a level section of the creek at the midpoint between the two waterfalls. Smooth sheets of water cascade over granite slabs all around the campsite, the upstream falls are visible from the site and the roar of the falling water is almost overwhelming. It is a wonderful spot. Lower Canyon Creek Lake’s outlet cataracts. The three main waterfalls in Canyon Creek are not the end of the story as far as awesome falls go. Amazingly, these are only the top specimens among an impressive array of falling water. Numerous cascades pour down the granite walls of Canyon Creek’s canyon, adding a great deal of drama to the great beauty of the granite cliffs. These cascades are too numerous to identify individually. However, there are some noteworthy waterfalls on Canyon Creek that, though not as awesome as the main trio, still deserve recognition. Some of these, like the large, wide falls that are often incorrectly identified as Lower Canyon Creek Falls or the possible candidate for Upper Canyon Creek Falls have already been mentioned. Another great example is Lower Canyon Creek Lake’s outlet cataract. When the water pours out of the lake it tumbles down 300 feet over a succession of granite slabs, troughs and benches. Though not considered one of the main Canyon Creek waterfalls, if it were anywhere else in the region it would be a major waterfall. All of these waterfalls are accessed via the Canyon Creek Trail. 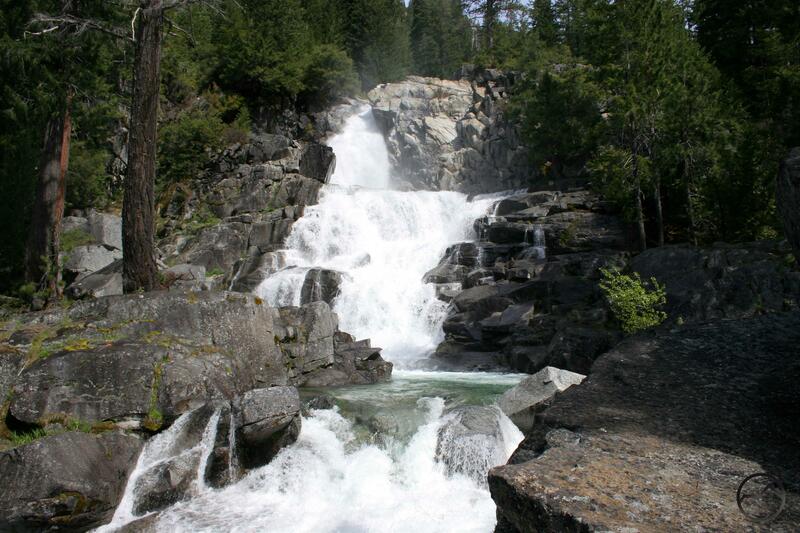 Though Canyon Creek has the highest concentration of major waterfalls, the true monarch of the Trinity Alps is stunning Grizzly Falls. Not only is it one of the highest waterfall in Northern California, it is certainly one of the most spectacular. Indeed, Grizzly Falls is one of the few waterfalls outside of Yosemite that can compete with that park’s legendary cataracts. The falls initially pours off a sheer granite cliff into a wide cleft. First drop consists of a 100 foot freefall before crashing onto a granite rib. From there the falls makes a series of leaps from one rocky bench to another. After a couple hundred feet of successive drops the falls finally pour over a vertical cascade that is nearly another 100 feet. A few more cascades with a somewhat lesser grade finally deliver the water to Grizzly creek proper…only to see it submerge beneath a vast talus field composed of bright white granite. The creek finally reemerges a couple hundred yards downstream as it enters verdant Grizzly Meadow. Taken together, the entire waterfall is somewhere around 450 feet high. However, as great as Grizzly Falls is, it is just one of many pieces that make up an unbelievably magnificent spot that must be ranked as one of the most spectacular places in all of the American West. 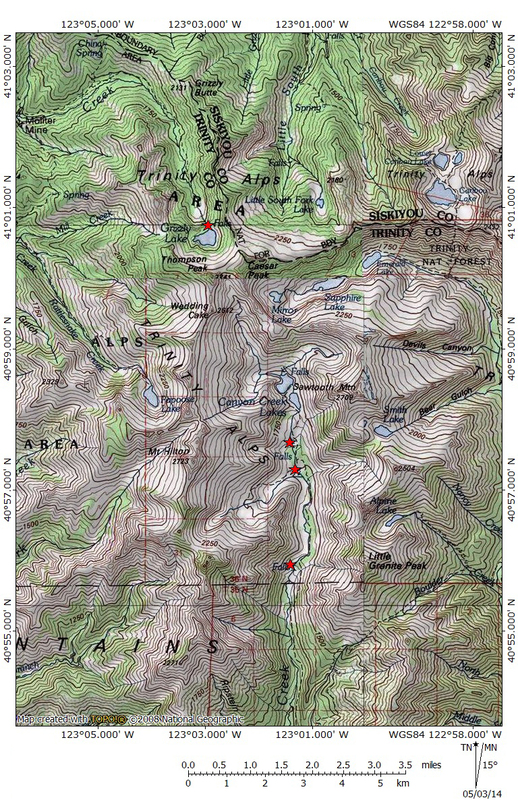 The scene begins with Thompson Peak, the highest point in the Trinity Alps. The granite tower looms majestically over a vast basin at the head of a long canyon. Clinging to the cliffs below the peak’s summit is a surprising glacier. This is the only glacier in California that is not in the High Sierra or on Mount Shasta. At the foot of the cliffs is fantastic Grizzly Lake. 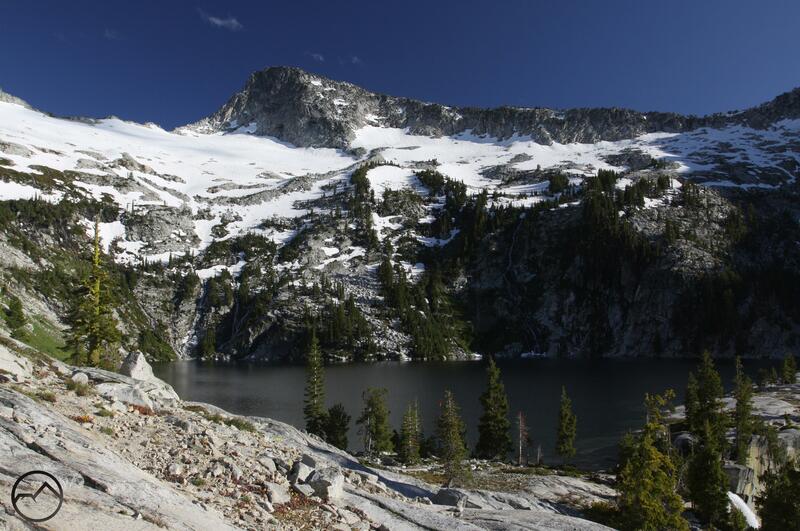 The third largest and second deepest lake in the Trinity Alps, it is one of the greatest alpine lakes to be found anywhere. The entire scene of lake, cliff, glacier and peak, highlighted by over a dozen large cascades is enough to render anyone speechless at the sublime beauty. Yet all of this is capped by Grizzly Falls. While most alpine lakes have an outlet creek, where the lake’s waters discharge, Grizzly Lake’s outlet is Grizzly Falls. The waters go directly from the lake over the precipice and make their 450 drop down to Grizzly Meadows. It is a scene with no counterpart, an alpine vision nonpareil. Of course, such amazing beauty comes at a price. While the Canyon Creek waterfalls are all found along the easy Canyon Creek Trail, Grizzly Falls and its accompanying spectacle is remote with difficult access. To reach this sublime place one must either make a significant commitment of time and approach via the North Fork of the Trinity River or begin in the Salmon River watershed and make the grueling climb over a high canyon ridge and then descend down into Grizzly Creek’s canyon. The former option is not particularly taxing physically but it requires a significant time investment, usually around 4 days or so. The latter option can be done in a single day but exacts payment in sweat and blood. The excessively steep climb and equally vertical descent is…invigorating…to say the least. The trail is uncompromising in its climb and unforgiving as it drops. Still, whatever price that must be paid is worth it. Few places are as magnificent as the Grizzly complex. 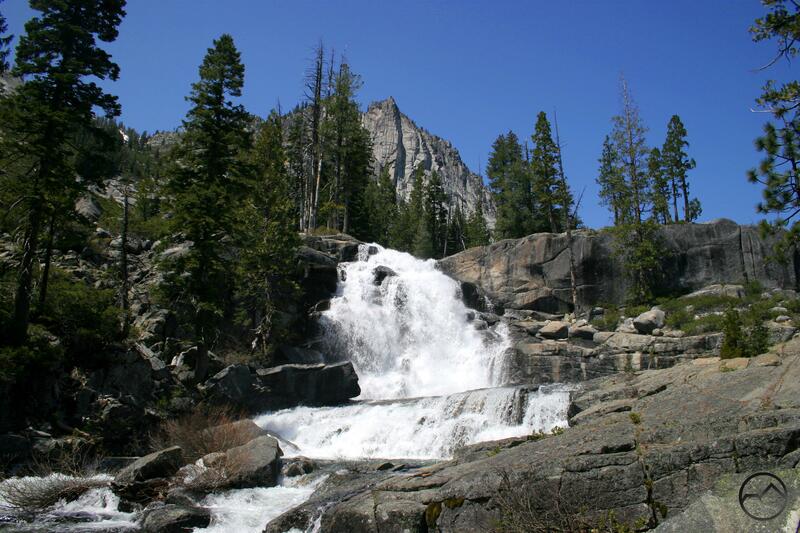 Grizzly Falls is accessed via the Grizzly Creek Trail. So cool. I need to find some time to get a good hike in over there! Man, I really hope you are able to. The Trinity Alps are absolutely incredible. I know I shouldn’t but I sometimes forget just how vast, rugged and spectacular they are and then, when I go there again, I fall in love with them all over again. It is like having our own pocket of the Sierra Nevada right in our backyard! I have to agree with you on Grizzly Lake. I’ve only managed to get there once, but it was so incredible that it stuck in my mind and I’ve been wanting to get back there ever since. Of the lakes I’ve hiked to in the Trinity Alps, Grizzly Lake was easily the best. Some of the other lakes in the Trinities really are fantastic: Caribou, Canyon Creek, Emerald, Sapphire, Smith, Diamond, Granite, Bear, Echo…and the list goes on. However, at the end of the day, nothing beats Grizzly. The combination of towering granite, glacier, massive lake, plunging waterfall and lush meadow pretty much sums up alpine heaven in my book. I think the whole Grizzly complex is, simply put, one of the most spectacular places in the entire country (and I have been around the block a few times…). I hope you are able to make it back there at some point. It is magnificent!